The Commercial Visible Model 6 is a deceiving machine. There never was a Commercial Visible 1, 2, 3 or 4. There is a no 5, as well as a Commercial A that seems identical to the Commercial 6. And apparently the serial number count started at a staggering 22,000, although it is thought that no more than 3,000 of these machines were built and sold. Having said that, the Commercial Visible is a machine of striking beauty. The slim waisted machine with its charming profile and beautiful decals is much wanted among collectors. 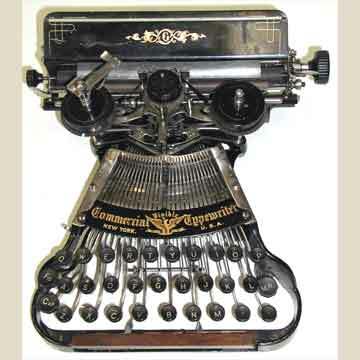 The machine was designed by Richard Uhlig, who was involved in the design dozens of other typewriters. The machine was originally marketed (in a slightly different shape) as the Fountain, in 1898, also sold as the model 5, but less than 300 of those are said to have been sold. The machine reappeared in 1901 as the Commercial Visible 6. The Commercial Visible prints with a typewheel that is much like the typewheel used on the Blickensderfer. However, on the Commercial it is not the wheel itself that strikes forward, but like the Chicago and the Hammond, a hammer strikes the wheel from behind the paper (pic 6). The Commercial Visible was also available in white at a 5 dollar surcharge. That version is even more rare than the machine presented here. For more details see the book â€œTypewriterâ€�, page 131.